Got Your Milk & Bread? Don't Forget Your Ice Melt! 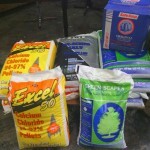 Ice Melt 50 lb Bag $9.00 Each Excel 50 Calcium Chloride 94.9% Pellets Green Scapes Ice Melt Road Runner by Scottwood Safestep And Select Others Your Choice Only $9.00 Per Bag/Box While Supplies Last!